Hello there! If you are just now checking out my blog, I have moved on to posting about our Winter-readying process. Last weekend, we installed a tankless water heater into our RV. Thank goodness for unending hot water!!! It is a Precision Temp RV-550. We replaced our 10 year old, 6-gallon Suburban unit and haven’t looked back. The new model has completely changed RV life for the better! If you’d like to read that post, you can check it out HERE. This weekend, we tackled the fun process of getting our RV ready for subzero temps and lots of snow. We are spending Winter in our RV this year, up in the beautiful Rocky Mountains of Colorado. We were up here for Winter last year, as well…but, we had chosen to endure it in a house instead. I didn’t think we’d survive Winter in our RV. So, what’s changed our minds? Well, we missed our RV so much, that we moved back into it in mid-April. Large house living just isn’t for us. We gave it a good 4 1/2 months effort, but in the end, the RV was calling. 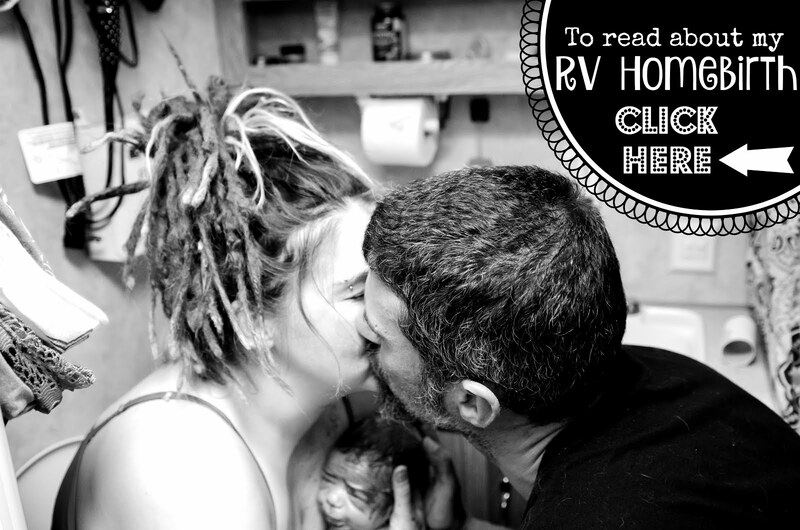 We had grand hopes of hitting the road again, but the day before we moved back into the RV, we found out we were pregnant with #3! If there’s one thing Fulltime RVing has taught us, it’s to go with the flow. We decided to still move into the RV and we would go from there. Initially, I thought we could hit the road, and being homebirthers, I would just transfer care to a new Midwife at each new location we rolled in to. But, before we decided to go with that plan, I called my former Midwife and asked her for recommendations for a new, local one. She hooked me up with an amazing woman here and I knew after talking to her for 2 hours, that we weren’t going anywhere. There was NO WAY I was gonna leave her. The best part? She was 100% fine with our home water birthing IN THE RV and she lived just 5 minutes down the road. It was fate. We’ve been at the same park since April and since then, we’ve established relationships with the locals that live here. Several of these folks have lived here for YEARS. Lots of them have older RV’s than ours (also without sealed underbellies) and they ALL insist, that we’ll be “just fine this Winter” in our RV…as long as we do this, this, and this. So here’s the “this, this, and this”…plus a couple other additions we’ve done to Winter ready our rig. Ya know…just for good measure. Please be informed, that this is a pretty long, and (hopefully) pretty thorough blog post. I didn’t want to leave anything out…especially for those of you that have inquired as to how we have prepared for this upcoming season. At this park, there are only 2 types of skirting allowed: foam insulation with the silver side & REAL paintable housing siding. We went with the foam insulation, since it was cheapest and seemed easiest to install (and it’s what everyone here uses). We got it THIS from Home Depot. Since it comes in 4 ft x 8 ft sheets, we were able to cut most of them in half lengthwise and get 16 feet of length out of one sheet. We kept the screw holes in the side of our RV from Winter readying in New Mexico last year (blog link at the end of this post) and got longer screws. The screws were thread through a washer, the hole was lined up to the hole in the RV & the screw was poked through the insulation. Then, it was screwed into the side of the RV, at the bottom. My Husband didn’t cheap out on tape. That’s pretty important. We sealed the top of the foam to the RV and along the pieces of foam to join them. We did this, because when the snow melts or there’s ice present, it won’t slip behind the foam and wreak havoc under our RV. The tape is HVAC quality, extreme weather tape and that was also purchased from Home Depot. Check it out HERE. The screw/washer setup and you can see the foil top sealing the insulation to the RV. The stairs Nic built last year come in handy during times like this. They allow us to fold our RV stairs in under the RV, which makes skirting in front of them, super easy. However, we will need to get some outdoor carpet, or fake grass or something to put on the steps. That’ll offer more traction during the foul weather, and hopefully prevent slipping on icy steps. Or we could just keep a bag of salt by the door…but I don’t have room inside for that. The wheel wells took mostly a whole sheet of insulation. Please excuse all the ooze in front of the wheel well. This is the only piece not taped to the RV. It is our “tanks access entry” piece of foam. For the slide, we bought smaller foam noodles (pipe insulators) at Home Depot in the plumbing department. You can check them out HERE. They are used to insulate pipes, but they are just the right size for wedging into the crappy seal of the slide, where it meets the RV at the top, bottom and sides. We also utilized the same foam insulation on the sides, that we used for the skirting. It got cut to the proper length and width, wedged into the outer sides of the slide, then taped where it touches the side of the RV (not the outer wall of the slide) and taped at the top to seal it to the RV. He also ran it from the underside of the slide to the ground and secured it in place via wedging it in underneath, taping the corners to the side pieces, and then kicking the gravel up alongside the bottom. …It then runs alongside the skirting under the RV, up the back of the skirting and attaches to the Camco water filter. The filter is also wrapped the same, to protect it from freezing. The hose comes out the top of the skirting through a notch Nic cut, and attaches to the RV’s city water hook-up. It is protected from the elements by THIS foam thing. It’s called a Standard Faucet Cover. This is the only thing we haven’t Winter-readied yet. Most people living here, hardline their wasterwater hoses straight out the bottom of the RV (removing their tanks) via PVC tubing, to the sewer. Those people aren’t going anywhere anytime soon, though. We’ve had a couple ideas for protecting it, and the one we’ve decided to enact is the good ol’ cardboard concrete tube, like we used for the water spigot. It will be a very similar setup as well. We won’t be shutting our grey tanks ever, so we need to make sure to do a good job on this. We have been told there’s no way this hose will freeze if we leave our grey tanks open…as long as we insulate it…so here’s hoping they’re right! We will run heat tape along its length, forgoing the pipe insulation, however, and wrap it in standard duct tape. Nic will then wrap all that in the R-13 pink insulation and cover that with the cardboard concrete forms that have been cut in half, lengthwise. That will turn them into an arch shape, rather than a tube. Those arches will be covered in the Reflectix, which will be taped to them via the HVAC-extreme weather tape, then placed over top the insulation. The rocks will be kicked up alongside the bottom edges of the arches and, in theory, all should be well. With our tankless water heater now, we use WAY TOO MUCH water to be able to open and close our grey tanks all the time. I am not about to run outside, with snow everywhere, Every. Single. Day. to open and close them. So this had better work! Windows are a HUGE source of heat loss for us. These are not fancy, gas permeable, double-paned, whatever windows. They are crap. So, Nic took some of the leftover foam insulation, taped off the foam sides with the remaining HVAC tape and cut pieces of Reflectix to the exact dimension of the sides of the windows. The Reflectix went into the windows first, then the tape-covered foam insulation was wedged in front of that. Only the window edges could be done like this, that way we can still open the windows…but you’d be surprised how much of a difference it has already made inside. It also eliminates the condensation build-up in those areas. What it looks like from the outside…nothing fancy. Here’s what it looks like from the inside. Tigger is glad we didn’t block off the middle of the windows. He likes to sunbathe. Those sections are wedged in ultra tight. Someday, we’ll have to cut the crap out of them, if we plan on getting them out. The windows in the RV all have custom sewed (by me) curtains. They consist of the Eclipse brand thermal curtains, with a layer of Eclipse brand room darkening curtains in front of that. Without these curtains, we would all freeze to death. Ours have a 3rd set of curtains in front of them, even…but they are just sheer. So they are useless. All of the THERMAL curtains can be velcroed shut down the middle…for maximum, cold-keeping-out capabilities. The wall that is the head of our bed has since become a condensation nightmare. When Nic rebuilt this room last month, he sealed off ALL sources of cold-air leaks, and replaced the insulation, so now this room is locked up airtight. You would think that would be a GOOD thing…but it’s not (apparently). That window is our escape one, so it cannot be done away with (like our other window was). Because of this, condensation builds up REALLY bad on that wall…which just so happens to be our headboard. We were constantly dealing with damp pillows. But not anymore! He cut a length of the foam insulation, covered it in the HVAC extreme weather tape. He wedged it between our two walls, under our windowsill and behind the head of our bed. We now have ZERO condensation on that wall. I know, because I am constantly pulling it out to check between it and the wall to see if it’s building up…and it’s not. Added bonus: that wall is now EXTRA warm. Woohoo! Another large heat loss source, is our ceiling vents. These were simple enough. Cut Reflectix to the dimensions of the vents, jam that up there first (to prevent condensation build-up), then stick in the Camco foam vent cushions behind it. Without the Reflectix, the condensation soaks the cushions. It’s gross. For the vent cushion in our bedroom, I cut a slit from an edge to the center and sewed the fabric to each other, all around the length of the slit. That way, I can keep my chandelier hung there, but I can still put the cushion in around it. The cushion has since been dubbed “The Buttcrack Pillow” by my ingenius family. (Side note: as I typed this, I went on Amazon to get the link for the inserts, and found that Camco has since made a cushion that has the Reflectix on one side…it’s about friggin’ time.) We also cut a square of the Reflectix for our bedroom ceiling vent, with the slit going to the middle, to be shoved into place before “The Buttcrack Pillow”. These are simple enough. We looked up our A/C units, couldn’t find them in Camco’s list, so Nic hopped up on the roof to measure each of them. Once I had the measurements in my hand I ordered two A/C unit covers. They’re nothing fancy, just Vinyl, with a drawstring cord, but they stop the cold air from blowing into our house through the units. So that’s awesome. You can get them HERE. Another condensation nightmare in our RV, is our closet. I’m assuming the clothes retain a lot of heat, and having them up against that ultra cold wall, makes for moisture build-up? That’s my theory at least. Nic solved the problem, by covering the wall behind the closet in Reflectix (cuz you can’t see it with the clothes blocking everything). He cut out a rectangle of the insulation foam, covered the backside and edges with the HVAC tape, and placed it into the window of the door. Then, he covered the door in the Reflectix. Yes, the backdoor is hidden behind our closet…but it’s still accessible…in case of an emergency. These two electric heaters are utilized on super cold nights, in addition to the furnace. They’re the same heater. They can either be horizontal or vertical. They work marvelously for heating up the individual spaces. You can get them HERE. Since we’ll be upping our Propane consumption monthly, thanks to the furnace running all the time, we went ahead and bought a 100 lb propane tank. We’ve been told, for our family and RV size, to expect to get about 3-4 weeks use out of it. Nic also has our 2-30 lb tanks and a 20 lb tank as well…just in case. He likes to be prepared for anything. HERE are the TANK HEATERS that we purchased for our 2 separate 40 gallon tanks. They run about $125 each, after shipping. The weather has to be warmer than 55 degrees to adhere these to the underside of your tanks, however, so we’ve yet to install them. It’s Colorado though. I’m sure we’ll get a nice enough weekend to install these soon. They have to be wired to your battery, since they run on DC. They state to clean the tanks first with rubbing alcohol…NOT bleach, before you adhere them. We got a tankless water heater for not only ourselves, but for our impending RV home waterbirth, as well. I’m gonna need a decent amount of hot water to fill my birthing tub! And I certainly don’t want it to be cold. You can read about our Precision Temp RV-550 Tankless Water Heater Installation HERE. We are now ready for hot water in all 4-seasons! It works like a charm! Lastly, my Husband got one of these to monitor the indoor, outdoor and underbelly temps throughout Winter. He said it was for a good reason…but I think he just got it because he’s a weather nerd. Lol! The control panel stays inside your RV, and you can get up to 3 remote transmitters, to put wherever you want outside, that this thing will read. It was nice to see when it hit 14 degrees the other night, that our underbelly was sitting pretty at 40 degrees! That’s quite a difference. I guess all our hard work Winter-readying has paid off in the long run! If this is your cup of tea as well, you can get the controller + 1 remote transmitter combo HERE and any additional remote transmitters HERE. Lastly, the only thing we REALLY need to still do, is get our generator up and running. Winter power outages for a couple days (at least) are quite normal up here. We lost power 2 times alone back in MAY. This RV comes with a pretty nice Onan generator, but in all of its 10 years, it has never been used…neither by the previous owners, nor us. We DID get it to fire up once, right after we bought the RV, but we couldn’t get it to stay on, without having it hooked up to an active car battery. Other than that, we are ready to go…(once we winter-ready the wastewater hose). An additional note, we are on the fence about purchasing and utilizing a dehumidifier. Colorado is already so dry, that the little bit of humidity we accumulate in this RV, we appreciate…especially now that we no longer have any condensation problems. I know it seems like a lot, and it kinda was at the time (especially for Nic…I just handed him stuff and took pictures), but it is ALL important…especially because we are wintering in this location. We made it nearly an entire Winter without any condensation issues. Those of you in more humid locations may not be as lucky, however. We moved to Texas on March 3rd, to spend time with my dying Brother, but I am fully confidant that we would have had no complications...assuming our electricity never went out. We hit subzero temps and 2+ feet of snow several times times this Winter. If you feel that we left something out, feel free to let us know! You can email me at zoe.the.stitch.witch@gmail.com. The same goes for anyone out there that might have more questions or comments about our process. Feel free to leave us a comment in the comments below, too! Thanks for reading through this crazy long post! We look forward to hearing from you and sharing more with you soon!